La Leche League welcomes all women, together with their babies and children, who are interested in learning more about breastfeeding and mothering. Meetings are free of charge, but membership is greatly appreciated and encouraged! Thank you for bringing quiet toys for your children and a nutritious snack to share. In bad weather, we follow local school closings. Delmar La Leche League has breastfeeding on the menu! We offer four meetings per month - morning, noon and night - to provide the best breastfeeding support for you! 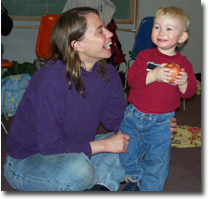 Enrichment Meetings are led by both Leaders and other mothers. We cover a range of subjects that relate to parenting, from baby-wearing to book discussions. Start out your day on the right foot by coming to our morning series meeting! Located at the indoor community room at the Bethlehem Public Library, this space is perfect for mothers living in the Capital Region. We invite you to join us for mother-to-mother breastfeeding support, and be back home in time for lunch and a nap! Potluck snack: Have an extra box of crackers sitting around the house? Feel like making a batch of muffins? Please bring your potluck snack if you have the knack! Meetings begin at 9:45am and end around 11:30am. October 17th, 2011 - Bringing Baby Home! 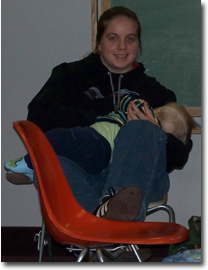 November 14, 2011 - The Normal Course of Breastfeeding: Overcoming Breastfeeding Challenges! We are starting up evening meetings for the summer! These meetings are awesome for moms who are planning on going back to work, school, or simply enjoy night-owl dates with their babies! Please email ChanaMayaRitter@gmail.com for our Albany location. Come and join our online chats!